What is Thatcham TRI Accreditation? Thatcham TRI is the standard and guidelines set for vehicle security installers to work to. In order for the security device to be recognised by an insurance company it must be fitted by a Thatcham TRI installer. In addition to the high standards set by Thatcham all employees have to be police checked and fully insured. Some installation companies often use the Thatcham logo and claim that they are Thatcham TRI Accredited. You should always check the the status of a company by looking at the TRI list of installers. A main focus for this accreditation is in the fitment of car trackers, specifically Category 5 stolen vehicle tracking systems. Whilst many tracking device manufacturers will allow category 6 systems to be installed by non accredited installers, the Cat 5 tracking device MUST be fitted fitted by an accredited installer. 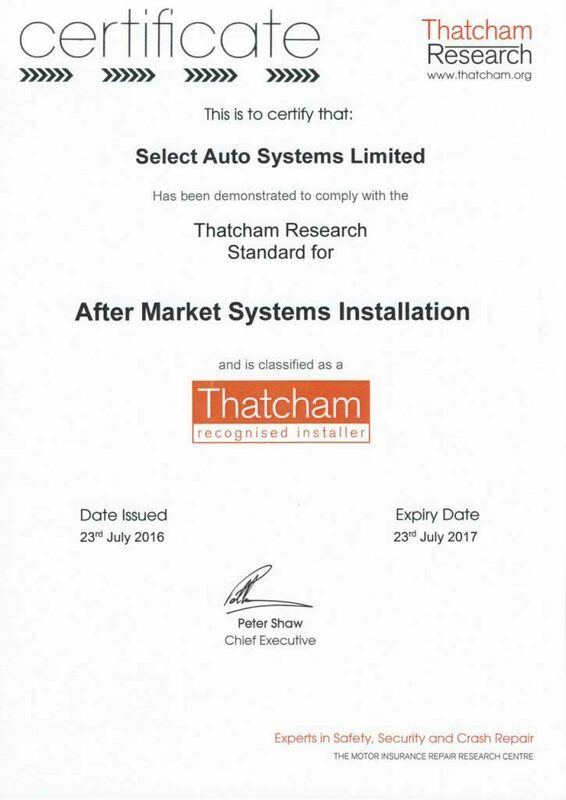 Select Auto Systems Ltd was one of the first companies to gain TRI status for Thatcham Category 5 systems. We feel that this is important for the customer as it ensures a high standard of workmanship. All our engineers are fully insured and have public liability cover for up to £5,000,000. The role of Thatcham also includes testing and categorising the security devices. Most of the testing is carried out at their premises in Berkshire, but the testing of the tracking devices is done in a manner that simulates a vehicle theft. For example, with a category 5 device, the unit will need to send out an alert if it is moved without a driver card. Once the alert is received it will be tracked across parts of the country; this includes tracking the vehicle for a specified time whilst running on its own power supply ( battery backup). The vehicle will also be tested for the immobilisation to stop the vehicle from being restarted. Only when this test has been successful will it be moved onto the next step which would be to certify and check the Security Operations Centre. Click here for more information on Category 5 trackers. Our Thatcham Accredited engineers can fit on location in London, Surrey, Sussex, Kent, Essex, Hertfordshire and the surrounding counties. Through our network of expert installers we are able to further cover the rest of the UK. Get in touch to ask about your location.